One of my favorite paintings is Andrew Newell Wyeth‘s Christina’s World (1948). 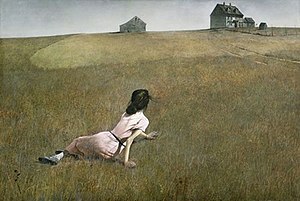 Perhaps his most famous image, it depicts his neighbor, Christina Olson, sprawled on a dry field facing her house in the distance. It seems that Wyeth was inspired by Christina, who, crippled with polio and unable to walk, spent most of her time at home. Besides his attentions to the details of the field, the Olson farm, the colors, and the shading, the greatness of this piece is how his painting depicts movement. We the viewer join her in her desire to crawl home. It is hard to look at this and not to experience the emotion of yearning. It must have been amazing for those three times a year for the Cherubim to touch, but what of the rest of the year? Rabbi Kattina’s Cherubim spent much of the year frozen and reaching out for each other. Like Wyeth’s Christina caught struggling to get home, the Cherubim are perpetually caught in a state of yearning for each other. I have been thinking about this on the occasion of having recently turned 40. I am sure that I am not alone in still thinking of myself as an 18-year-old. It has been hard to come to grips with the fact that my children are much closer to my imagined age then I am. My father-in-law said it well in a very touching birthday note. He wrote, “today you are 18 years old with 22 years of experience. In other words, it is all about attitude in life. You are living your life to the fullest, always searching to maximize your opportunities and experiences.” We are always reaching and yearning for things that are out of reach, being the Olson Farm ,the other Cherub, or being 18 again. On the occasion of reaching this milestone it is important to take stock of how many things I have been able to reach in my life. I have been blessed with an amazing wife, a beautiful family, and meaningful work that I enjoy doing. What am I really yearning for? What do I want to accomplish with the rest of my time on this earth? Reaching this milestone has helped me focus in on the things I still want to do with my life. I am confident that best is still ahead of me.